The westerly region of Turkey's Mediterranean coastline is especially popular and sandy beaches around Antalya and the Konyaalti Bay are in abundance. With a particularly diverse landscape, it is actually quite feasible to enjoy a morning swim, and then head to the Taurus Mountains for a spot of skiing in the afternoon at the neighbouring resort of Davras. Antalya's historical Old Town area known as the Kaleici offers beautiful harbour views and is surrounded by medieval fortified walls, which date back before both the Roman and Byzantine periods and have been restored many times. Currently the fasted-growing city in Turkey, Antalya enjoys an idyllic climate for a good deal of the year and much tourism. In the city centre, Taksim Square leads to the elegant street of Cumhuriyet Caddesi, where the tourist information office is located, along with plenty of hotels and shops, while the Republic Squares gardens are close by. Old Town Antalya is where tourists will find many of the city's oldest attractions, with numerous mosques adding much Turkish character. The city's beaches offer something quite different and are always very busy during the summer, when holiday makers often choose to head to some of the nearby beaches just outside of the city's environs. Antalya's newly opened Beach Park offers fun for all the family, with its Aqualand featuring countless water slides, and the adjoining Dolphinland is home to a collection of dolphins, sea lions and white whales. For a little more history, be sure to check out the ancient cities of Phaselis and Perge (Perga). 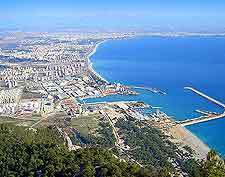 More information about Antalya Tourist Attractions. During the Middle Ages, the city of Antalya was an important Byzantine stronghold and today, a number of its medieval landmarks remain in a good state of repair. Hadrian's Gate is amongst the most famous and its three beautifully preserved arches once formed the main gateway through the ancient city walls, almost 1,900 years ago. Other important sights within Antalya include both its Fluted Minaret (Yivli Minare) and its Truncated Minaret (Kesik Minare). 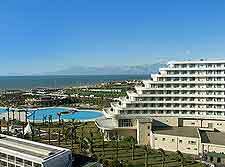 More information about Antalya Landmarks and Monuments. Although it is true to say that Antalya is far from overflowing with museums, artefacts and historical information, there are a few such attractions worthy of a little time. The Antalya Museum (Antalya Müzesi) really does stand out and offers an insight into the city's Roman and Ottoman past. Another good bet is the Suna and Inan Kirac Kaleici Museum, while close by, further museums await in the neighbouring seaside resort city of Alanya. More information about Antalya Museums. There is a truly extraordinary selection of tourist attractions situated on the outskirts of Antalya, including spectacular Roman remains, picturesque stretches of coastline and national parks. For the most impressive ruins, a day trip to either Patara or Termessos won't disappoint. Antalya is also within reach of the port town of Bodrum, the Turkish capital of Ankara, and the cosmopolitan city of Istanbul, as well as popular tourist destinations such as Aspendos, Izmir, Kemer, Olimpos (Olympos) and Demre - the home town of the world-famous Saint Nicholas of Myra, who to most is perhaps best known as simply Santa Claus. 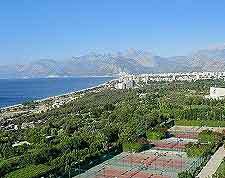 More information about Antalya Attractions Nearby.